Home / DDS / Liberal Party / Mark Lopez / Mark Lopez Burns Pangilinan / Pro-Tambay / Sen. Kiko Pangilinan / Tambay / Viral Stories / Mark Lopez Burns Sen. Kiko Pangilinan for His "Pro-Tambay Info Drive"
Mark Lopez Burns Sen. Kiko Pangilinan for His "Pro-Tambay Info Drive"
Veteran Blogger and prominent social media personality Makr Lopez burned down Sen. Kiko Pangilinan for his controversial "Pro-Tambay Information Drive" he posted on Twitter. Sen. Pangilinan gives pointers on how to deal with the authorities once they were apprehended as "Tambay." 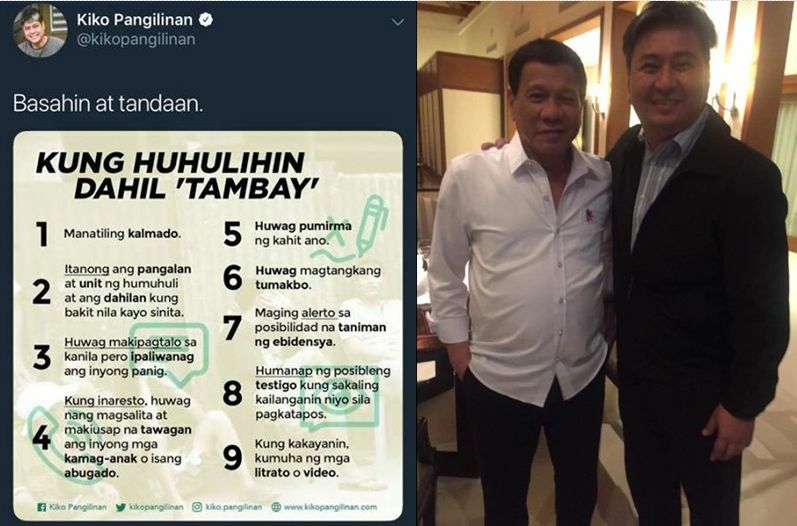 Sen. Kiko Pangilinan listed a total of nine (9) reminders every Tambay should learned and memorize if ever they are apprehended because of being a certified "Tambay." The Pro-Tambay information drive of Sen. Kiko Pangilinan was criticized by Mark Lopez who burned down the Senator because of his statement favoring the Tambays and giving them the ideas on how to deal with authorities who could apprehend them despite the fact that there's already an existing vagrancy law in the Philippines aside from the curfew hours implemented by different municipalities and cities across the country. Mark Lopez lambasted Sen. Kiko Pangilinan by reminding him the lessons he learned from his parents, to stay away from Tambay if you want to be safe always. "Huwag Tumambay o Maging Tambay!" Para hindi ka malagay sa alanganin at kapahamakan, iwasan mo ang maging TAMBAY! Napaka basic: HUWAG TUMAMBAY o MAGING TAMBAY!